And now commenced a new life for my father. He felt so new inside that he was sure he must look new outside. And so he did. There was a hand-glass in the waggon. My father was continually examining himself in it, he looked at himself all over, at least as much of him as could be perceived in the glass, and when he had done this minute inspection he would say to himself, "Is this old Cornelius?" It was not. The old Cornelius was dead. The new Cornelius was a great surprise and delight to my father, and also to his children. As it is written, "If any man be in Christ, he is a new creature: old things are passed away; behold, all things are become new." Christ makes new men and a new creation. No sooner had my father begun this new life than he had to withstand the assaults of Satan. His attention was first drawn to his old fiddle. He took it down, and I felt sure he was going to play "I do believe," and I asked him to do so. He said, "No, my dear, I am going to sell this fiddle." I said, "No, daddy, do not sell it, let Ezekiel and me play it. You can teach us how to." My father said, "No, that fiddle has been the cause of my ruin. It has led me into drink, and sin, and vice, and bad company. It shall not be the ruin of my boys. It shall not be where I am. I will get rid of it, and I shall not have one again until I feel strong enough to be able to manage it." So my father sold the fiddle and began to preach to the men that bought it from him. Look upon a little child." And after all they were only children, felt themselves children always, and possessed all their days a truly child-like spirit. Each of them was as sweet as a sister, as tender as a mother, and as playful as a kitten. They were very fond of singing and we children loved to sing too. As for anything deeper, we did not yet understand the need of it. We had no books, and if we had had books we could not have read them. Our first idea of God came from father's beautiful life in the gipsy tent - a life which was like the blooming of a flower, whose beauty won us all. If father had lived one life in a meeting and another in the gipsy tent, he would not have been able to rejoice today over his five children converted. But the beauty of father's character was most seen in his home life. We dearly loved to have him all to ourselves. Nobody knew what a fine, magnificent character he was as well as we children. Whenever we were tempted to do things that were at all doubtful, we at once thought of father, and if we had any suspicion that the course of conduct we contemplated would not be pleasing to him, we at once abandoned all idea of following it. Father's life was the leaven which leavened the whole lump. One Sunday morning, seven or eight weeks after their conversion, the three brothers set out to visit their father and mother. The old couple were camped in Loughton Forest, near High Beech. They walked all the way from Shepherd's Bush to Loughton ,and when they got within hearing distance they began to sing, "Gentle Jesus, meek and mild." Granny heard the voices of her boys, and knew them as every mother would have known them. She got up, and peering with her old, weary eyes over the bushes, said to herself, "Why, bless me, if thems not my boys coming!" It does not matter how old you are, as long as your mother is living you will still be a boy. Then granny, turning to grandfather, said, "I say, Jim, come out of the tent and see if these ain't my boys!" And the three stalwart men still marched triumphantly on with proud, smiling, beaming faces, singing, "Gentle Jesus, meek and mild." Then says old granny, "What in the world is the matter with you?" "Oh," says my father, mother, we have found Christ; we have found Jesus; we are converted!" My poor grandfather walked round the tent, saying, "My boys have come home to teach me what I ought to have taught them!" Granny soon had a meal ready for her boys. "Before we eat," said my father, "we always pray now;" and they all knelt down. As soon as they got off their knees, grandfather began to cry for mercy, and soon found peace. Grandfather's brother was camping with him, and he too sought and found the Saviour. He was ninety-nine years of age, and lived two years after this, dying a triumphant Christian death. Grandfather and grandmother were both seventy, and lived five years after their conversion. Presently the brothers returned to London, and soon were deeply engaged in Christian work. The gipsies were all turned off the ground where they had been staying, and the Gipsy Tabernacle went with them. My father hired a field at the rent of £25 a year, and all the gipsies followed him there. The tents were pitched round the field with the mission tent in the centre, and meetings were continually held. Once again, however, they got into trouble. Several of the antagonists of the Gipsy Christians got drunk, fought and made a great disturbance, with the result that the gipsies were sent away from the land. We still travelled about a little, chiefly between Cambridge and London. The winter months we spent usually in Cambridge and the summer months on the east side of London. My father was anxious that his children should learn to read, and he sent us occasionally to school. By this he reckons that I must have had about six or eight weeks' schooling at the most, one winter. These weeks comprise all my collegiate career. I had just enough schooling to learn my letters and a little more. The school was at Cambridge, the seat of learning; so I am a Cambridge man. While working clay by day to support their children my father and his two brothers never lost an opportunity of preaching the Gospel in chapel, in mission room, and in the open air. I remember their work in the summers of '73, '74 and '75. Their method of proceeding was in this wise: father would get out his fiddle, for by this time he had another one which he used in his meetings, and which proved a great attraction. He was accompanied by his two brothers and all the children of the three families. They would start singing and keep on singing until three or four hundred people gathered. And then they would commence an evangelistic service. The work that stands out most clearly in my mind is that which took place at Forest Gate. There was a great revival there, and as a result a large mission hall was erected, which is standing now I believe. About this time my father and his brothers got into touch with the Rev. William Booth, the founder of the Christian Mission. Mr. Booth gave them much encouragement in their work, and told them that the way to keep bright and happy was to work for God. He persuaded the three brothers to undertake a week's mission at Portsmouth. The town was placarded with the announcement that the three converted gipsies with their "hallelujah fiddle" were coming. So successful was the work that that week extended into six, and to us children in our tent, father being absent, it seemed almost like six years. When he was away, both father and mother were away. For he was mother as well as father to us. The six weeks seemed much longer to us than to the children of my uncles, for they had their mothers. At last we were told of the day of his return. We thought he would come back early, and we were ready for him at six o'clock in the morning. Alas I he did not come until six at night. It was his custom when he came home to embrace us one by one and speak words of tenderness to us. On this occasion, as on others, we all made way for the baby, namely, my sister Tilly. It was my turn next. I came after her. But Tilly stayed such a long time in my father's arms that I became very impatient. "Look here," I said, "it is my turn now; you come out!" "All right," said Tilly, quite cheerfully, "you get me out of my father's arms if you can." I knew that I could not do that; so I said, "Never mind, there is room for me too, and I am coming in," and I went. There is room, too, in our heavenly Father's arms for all. He pours out His love over His children with more fullness and tenderness than ever earthly father did; and remember no one can take us from our Father's arms. My father now became possessed with a strong desire to go to Baldock, the scene of his troubles, awakening and conviction. He had played his fiddle in the public-houses there for years. He felt he had done great mischief, and that now it was his duty to do what he could to repair that harm. He and his two brothers started for Cambridge. It was their custom to do evangelistic work as they proceeded on their way, and consequently their progress was not rapid. They stopped for the night just outside Melbourne and placed their waggons at the side of the road. The horses were tied to the wheels of the waggons and were given plenty of food. Then the brothers went to bed. At four o'clock there was a knock at the front door, and a voice shouted "Hallo there!" "Who are you?" my father asked. "I am a policeman, and I have come to take you into custody." "There is a law made that if any gipsies are found stopping on the road for twelve miles round they are to be taken up without a summons or a warrant." "You must take care," said my father, "what you do with me, because I am a King's son!" He sets the prisoner free." His blood avails for me." The keeper gave them rugs to keep them warm, and his wife brought them hot coffee and bread and butter. My father gave her a little tract, entitled, "The blood of Jesus Christ cleanses from all sin," and told her the story of our Lord's death for sinners. She drank in every word, and there and then trusted Christ as her Saviour. In the morning the brothers were brought before the magistrates and fined 25s. each, or in default they must go to prison for fourteen days. They had no money, but their fines were paid - by whom they never knew. 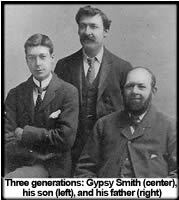 When the three gipsy brothers got to Baldock they told the people that they had been locked up at Melbourne, and the news spread on every hand, with the result that the interest in the meetings was very greatly increased. The first service was outside a public-house, and the landlady and her daughter were converted. The meetings were held in a meadow, and so great were the crowds that policemen were sent to keep order.